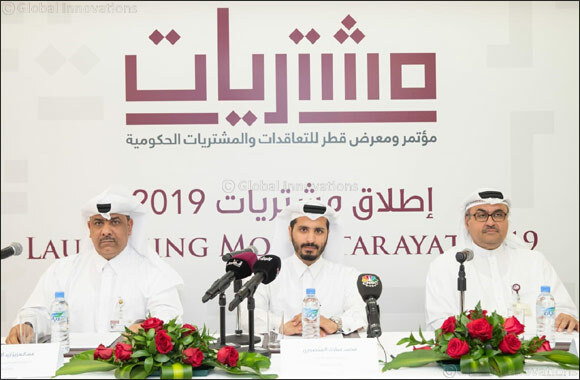 Doha, Qatar, 29 January, 2019: Building on the momentum of its preceding three editions of Government Procurement and Contracting Conference & Exhibition ‘MOUSHTARAYAT’, QDB announced that preparations for the fourth ‘MOUSHTARAYAT’ are at an advanced stage, which is scheduled to take place for 3 days, beginning on March 31 and ends on April 02, in collaboration with the Ministry of Finance, and in partnership with the Ministry of Commerce and Industry (MOCI) and the Public Works Authority (Ashghal), during a press conference held yesterday, at QDB main building. The Government Procurement and Contracting Conference & Exhibition ‘MOUSHTARAYAT,’ welcomes members of the private sector, particularly small and medium enterprises (SME), to attend and participate in a wide range of public tenders, which will be publicly announced. A key aspect of the conference is to educate the local SME about the procedures involved in existing public tenders extended by big buyers, such as larger private sector companies, semi-governmental and governmental bodies. This year’s conference and exhibition will provide SMEs with many opportunities as well as the platform to learn about existing public tenders extended by big buyers, such as larger private sector companies, semi-governmental and governmental bodies. In addition, Moushtarayat 2019 aims to educate attendees on the procedures involved in partaking in future tender and application processes successfully, so that members of the private sector may become more active contributors to the diversification of the economy. “Moushtarayat 2019 will usher in a wave of new opportunities for the government-private sector cooperation. The exhibition is an important platform for SMEs to communicate with government agencies and to identify tenders and contracts, thus opening the horizons of cooperation with government agencies and winning their tenders. QDB’s efforts will help enhance SMEs market positions both technically and financially by assisting to localize supply chains. The active participation of entrepreneurs and SMEs at previous three editions of Moushtarayat underscored the success of the event and demonstrated how deeply they valued new public sector opportunities.”. It is worth mentioning that Moushtarayat 2018 recorded a nationwide turnout of entrepreneurs, participants from SMEs, members of the larger business community and media personnel at its pavilions, which were largely hosted by government and semi-government organizations. The exhibition also witnessed the participation of 40 exhibitors, and 2000 job opportunities for SMEs were created with an estimated cumulative value worth up to QAR 6.5 billion. The expo also saw the National Procurement Awards, during the opening ceremony, where names of the five winning Qatari organizations were announced in recognition of their commitment to facilitating the entry of new participants into the Qatari marketplace. The winning companies included: The Ministry of Municipalities and Environment, Occidental Petroleum Qatar, Ministry of Public Health, Public Works Authority (Ashghal), Ministry of Education and Higher Education. This year’s conference will include several interactive sessions that aim to educate attendees on the procedures involved in partaking in future tender and application processes successfully. This year’s Moushtarayat conference and exhibition is the latest in a series of integrated programs and initiatives offered by QDB to develop SMEs. To promote the private sector, QDB locally extends wide-ranging financial and non-financial support to entrepreneurs across a myriad of industries so that SMEs may achieve higher scales of competitiveness in Qatar. Through the exhibition, Qatar Development Bank is trying to develop new supporting methods to apply sustainable government procurement. QDB also aims at helping SMEs commit to their goals and requirements, in order to support and strengthen the role of local small and medium enterprises, in line with the Qatar National Vision 2030. The exhibition is expected to bring significant achievements for all parties, where SMEs will be able to identify the existing opportunities and open new markets through their presence. Local buyers will also benefit from gaining more knowledge and establishing better dialogue with prominent buyers and suppliers. QDB’s efforts will help enhance SMEs market positions both technically and financially by assisting to localize supply chains.